Twitter hero “IAmHappyToast” deserves a Medal of Honor, or a Nobel Prize, or something, for creating a work of art that is truly uplifting to the American spirit. That art? 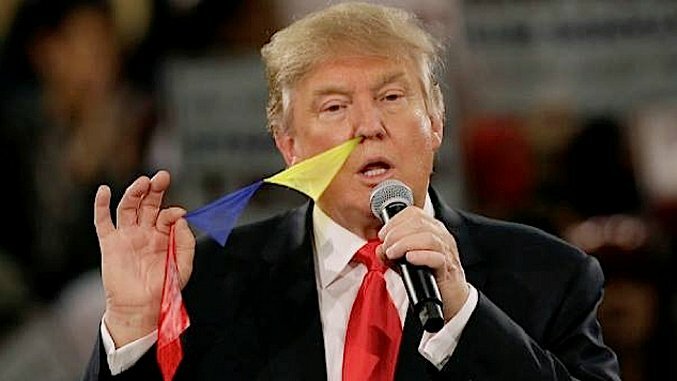 Donald Trump, pulling flags out of his nose. As of today, IAmHappyToast has photoshopped no less than 70 (!!) images of the Republican nominee skillfully, manfully, effortfully pulling flags from his nasal passage. Please visit the Twitter feed or Facebook page to see them all, and check out a sampling of our favorites in the gallery to the right.